I learned two things at the races today. First, my dad explained to me the difference between a hurdle and steeplechase. I wasn’t sure if it was a daft question, so I’m glad it wasn’t. Hurdle: all the jumps are the same height. 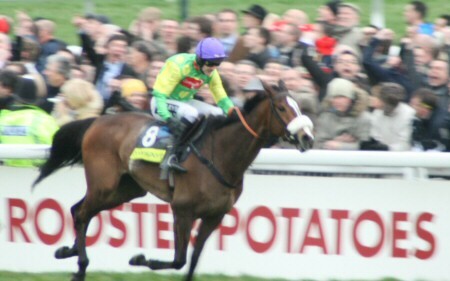 Steeplechase: fences vary and usually include a water hazard. In my head, sharks with frickin laser beams are a possibility. 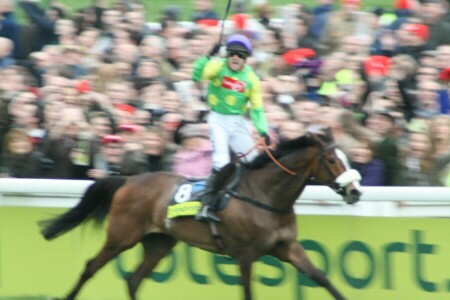 Second, I learned the name of jockey Ruby Walsh, who the crowd loved and chanted "Roo-Bee" at any availably opportunity. 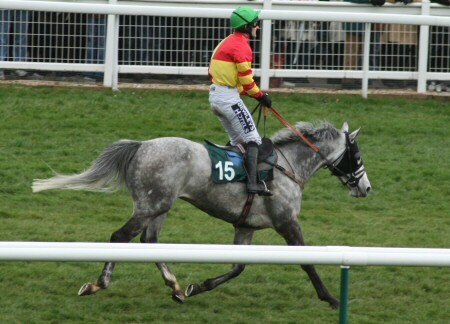 The only name from the racecard I actually recognised was The Queen (obviously an owner, not a rider). See, I really wasn’t kidding before when I said I was clueless about horse racing. My sister backed this at 20/1, which meant she won enough to pay me back for the ticket. So I felt like a winner too. Everybody in the world seemed just keep on piling money on him, despite horribly unattractive odds of 2/1 or lower (I saw it as low as 13/8 with some bookmakers). Perhaps if I’d bet on "Kay-tow" (as it was pronounced, but somehow with at least three syllables, by hundreds of Brummies on my train) instead of the three-legged beasts I actually picked by pretty much sticking a pin into my computer screen, I’d be able to afford a faster zoom lens with funky image stabilisation that would have turned this blurry photo into the triumphant shot that it should have been. Squint a bit, it helps slightly. Maybe there’s enough detail to use some clever "watercolour" filter in Photoshop and make it look intentionally like a painting. Worth a go, I guess.